Farmgirl Fare: 2008 Food Blog Awards: It's Time To Vote! The judges have made their decisions, and we're thrilled that Farmgirl Fare has been chosen as a finalist for Best Food Blog—Rural in the 2008 Food Blog Awards. Many thanks to those of you who nominated us. And now it's time for you to vote! If you aren't familiar with the four other finalists in the Rural category—Chez Lou Lou, Whiteley Creek, (not so) Urban Hennery, and Lucullian Delights—be sure to check them out before casting your vote. 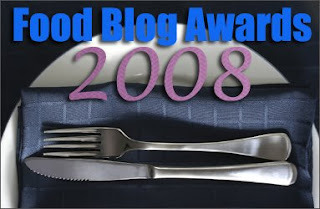 The Food Blog Awards are a wonderful way to discover dozens of the best food blogs around. There are 13 other categories you can vote on here. The voting polls close on Saturday January 24th at 8pm EST. Have fun! © Copyright 2009 FarmgirlFare.com, the foodie farm blog where nearly everything we do—whether it's starting seeds or battling blister beetles in the kitchen garden, collecting eggs from the chickens (or watching them hatch), tending to new mothers (with your mother) and their twin lambs, putting up hay for the winter, hauling water to the sheep (and livestock guard dogs), or even mucking out the sheep barn—somehow revolves around bringing really good food to the table. And we love every minute. Okay, maybe not all the putting up hay minutes, but definitely the rest of them. I voted for you because every bread recipe I have made from your site WORKS and is delicious! And because everytime I come here for a visit I get to see the beauty that lives with you on your farm and they makes me smile. Oh, the baby lamp...so sweet. My vote has been cast too! Best wishes to one of my very most favorite sites - LOVE IT!!!!! You got my vote! It looks like your winning when I voted, best of luck to you. I happily voted yes for you. I have been enjoying your blog for a couple of years now and look forward to visiting each day. I stumbled upon your site while looking for a recipe for beer bread - which was delicious BTW. I was raised in Missouri but haven't been back for 10 yrs. I love living vicariously through your blog. From most of your wonderful pictures I can "feel" the weather and hear the sounds that accompany them. Thanks for the lovely pause in my day. PS: Rainbow Chard Rocks! I love how you've connected so many different (and seemingly unconnected) parts of life to a single thread. That interconnectedness is hard to see sometimes, and wonderful to get that glimpse of. you got my vote too. i love this site. and a question: have you ever considered having an "Ask the Farmgirl" post where people can ask questions that have been plaguing them about the farm and your interesting life? for example, i've always been intrigued about how you keep yourself stocked with groceries and other necessities (i.e. milk, paper towels, and t.p.) while living so far off the beaten path. i assume there are no "quick" runs to the grocery store for a missing recipe ingredient. Thanks so much for your votes! Well, I just wrote about 7 paragraphs in response to your questions, and blogger decided to have an 'error.' I always copy my comments before hitting preview, but this time it unfortunately didn't work. 1. I've been wanting to put up a page of Frequently Asked Farmgirl Questions for a couple of years now. Since I'll probably never get around to tackling the whole big project at once, I'm thinking I might set up the page and open the comments so people can ask questions and I can peck away at them one at a time when I get the chance.